Hold Off Red is a quick, arcadey side-project. 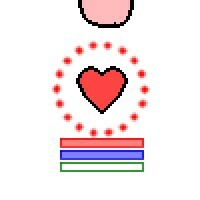 Shoot at enemies from your fixed point in the center of the screen, trying to defeat them before they reach your heart. Gain level-ups as you fight to increase your strength, and rack up kills without being hit to score combo bonuses. Unlock new game modes, special attacks, and more as you play.